Colleges split hairs when it comes to who gets admitted and who doesn't. Fair or unfair, the smallest thing can keep a student from not being admitted even if their grades and test scores are pristine. If the student is aware of the common pitfalls, they can avoid them. Why give colleges a reason to deny you? Here are the five biggest mistakes students make and how to avoid them. 1. Taking it easy senior year. As busy as senior year is, this is not the time for students to risk what they have been working towards for years. If a student is applying to highly selective colleges, they should continue to take all five academic subjects in the most rigorous curriculum. Colleges will be reviewing a student's senior year curriculum on their application, and they will also see senior year grades before they make most decisions. If the student's grades go down precipitously or their schedule looks light compared to previous years, colleges will have a clear cut reason to take a "pass." 2. Taking standardized tests too early and too often. Burnout is common with standardized tests. If a student starts taking these tests too early and too often, they can lose confidence in themselves or feel drained by the experience. Unless a student is a recruited athlete for a Division 1 athletic program, taking the ACT or SAT as a sophomore is downright premature. The damage of a low score in 10th grade leads these students to spend most of their high school career preparing for subsequent tests until they have taken way too many without the results they intended. Instead, students should take a diagnostic or practice ACT or SAT and decide which test suits them better. Winter of junior year is a perfectly acceptable time to start. Plan to take one of these tests once, twice, or three times at the most by the fall of senior year. Anymore leads to unnecessary stress and misdirected energy. Ever since the Harvard Graduate School of Education released "Turning the Tide" in early 2016, students feel like they have to do community service to get into college. Other students feel like if they don't play a varsity sport, they won't be viewed positively in the process. The simple truth is that it doesn't matter what a student does, as long as it is meaningful to them and they have been able to contribute in a positive way. Extracurricular activities need to be a genuine extension of a student's true self--not a long list of activities or an insincere project. Students are often afraid to go out on a limb when it comes to the essay. They commonly stick to topics that are obvious like extracurricular activities, over-used themes, or typical teenage-experiences without sharing anything too deep. We've gotten away from calling the essay a "personal statement." But that's what it is. It should be personal. It should share a small, very genuine slice of who they are. These are the stories that need to be shared. These are the stories that move other human beings, and thus will move an admissions officer to fight for that student when the time comes. 5. Applying to too many "reach" colleges. It is important to be optimistic, but in the college admissions process students need to be realistic too. Having a few reach schools on a college list never hurt anybody. But if the list is made up entirely of "reach" schools, the results can be crushing. The best lists range from four to 12 applications with a few "reaches," mostly "possible" schools within the student's range, and a few "likely" schools which the student could truly be happy attending. This is always the hardest part of making a college list. 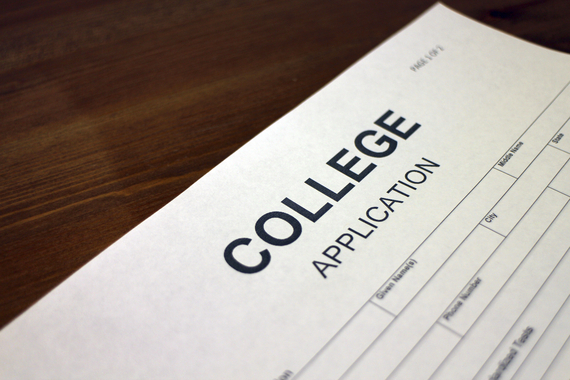 Kids and parents need to consider other colleges beyond the most selective. There are more things in a student's control than they think when it comes to getting into college. If they know what can help and what to avoid, they will find greater success. Students want to be viewed accurately and positively. To do that, students must take ownership of what they do in high school and the college application process. The results will surprise them when they do.